50 Year-Old Professor From Chennai Holds 145 Academic Degrees! Meet Professor VN Parthiban from Chennai who holds 145 Degrees.The story of this professor is truly inspiring and worth of getting motivated. Professor VN Parthiban, holds 8 Master of Law degrees (ML), 10 Master of Arts degrees (MA), 8 Master of Commerce degrees (M.Com), 3 Master of Science Degrees (MSc), 12 research degrees (MPhil), and 9 Master of Business Administration degrees (MBA). He also teaches more than a hundred subjects in various colleges across Chennai. Yes you read it right, the man has degrees more in number than double his age! Nowadays, when we are done with a maximum of 2 degrees, he shows no signs of stopping. A true example that age doesn’t matter in acquiring knowledge! "I really enjoy studying. It's not difficult at all," he said. "I have been continuously in the process of preparing for exams and applying for new degrees or diploma courses," he told the Sunday Indian. Not 5 not 50, he has 145 degrees! 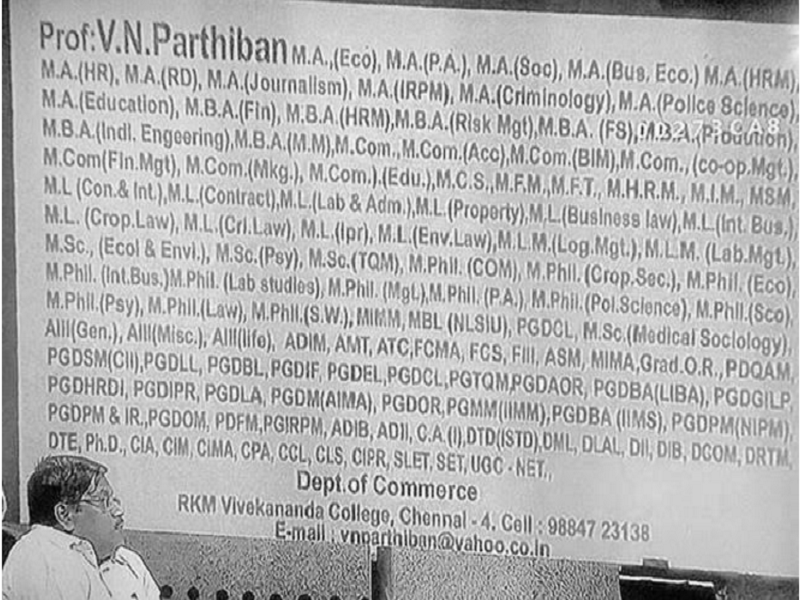 The professor’s visiting card is like a book in itself, overflowing with dozens of his academic qualifications. Professor VN Parthiban comes from a humble family in Chennai, and during his days, it was not very easy to go to a college. He says that failure has been an integral part of his journey so far. "I struggled hard to finish my first college degree and got a job in the judiciary department", he said. He started applying to so many courses, that there were times when he studied for the wrong subject and failed the paper. He also admitted that he has a Mathematics phobia, saying, "I registered for Actuarial Sciences which I could not finish as it involved lot of mathematics which required a lot of effort." Professor has sacrificed all of it in writing exams, so much that invigilators know him by face. But all of the 145 degrees has taken a toll on his memory, he finds it difficult to recollect people's faces and he even forgets directions to a place he visits every day. No matter whatever the consequences are, Professor Parthiban wants to continue his journey of life learning and collecting more and more degrees all way!